This article first appeared in "The Union" Newspaper January 8, 2016. When we think of memorable fishing trips, what comes to mind is warm sunny days spent on the water. But if catching fish is the main objective, you go when and where the fish are biting regardless of the season. The drought has limited lake fishing options here in the Golden State but Pyramid Lake outside of Reno NV is down a bit but is still a huge body of water. Guide Ed Fisk (http://fishtalesguideservice.net) and I have been discussing a trip to Pyramid Lake since last summer. I have been tying some new trolling flies and Pyramid is a good lake for fishing them. We both wanted a crack at a trout over 20 pounds and the only close lake that has them is Pyramid. In November, Ed proposed the week between Christmas and New Year. On a mild sunny day in November it sounded like a good plan. We would met at 6:00 AM the third day after Christmas. Fly rod & reel Wednesday morning. Monday December 28th dawned with a storm passing over the Sierra. As we drove up I-80 we got the word that we needed to chain up both the truck and the boat trailer at Kingvale to get over Donner Pass. Crawling around in the snow to chain up is to be expected in late December. There was a dusting of snow on the ground through Reno and all the way out to Pyramid. We checked in to our accommodations midday at Crosby's Lodge at the lake. It was not until 2:00 that we had the boat ready at the ramp and we were getting on the water. Ed has a saying that he can handle cold, rain or snow on Pyramid Lake but not wind. At 27 miles long, Pyramid has a reputation for rough waves springing up rapidly when the high desert winds come on. Monday afternoon Ed judged the air to be a breeze not a wind and we launched. The "breeze" was coming from the north. When we moved out beyond the shelter of Pelican Point there were waves up to 2 feet. We ducked back in behind the point to fish close to the west shore for the afternoon. We were rewarded with a pair of trout for a couple of hours on the water. The main thing was we had the boat and gear ready for the following morning. On Tuesday we were joined by Mickey Baron, a frequent shore angler at Pyramid. The day dawned with little wind and an overcast sky, great conditions for fishing. The air was well below freezing but the boat had a canvas shelter and a small propane heater. We took off heading north up the west shore. Ed has done well fishing the points extending out into the lake. We headed to Warrior Point 4 miles distant. Other anglers did well there recently with a fish in the 19 pound range landed a few days before. Within a half hour we were into our first cutthroat trout and we had intermittent action all day long. By mid morning the sun came out. Without much wind our gloves and hoods came off, it became quite pleasant. We were using down-riggers to get our flies down to the 20 foot depth where most of the fish had gone when the sun was on the water. The adage bright day bright fly, dark day dark fly was true this trip. On Tuesday tui chub pattern flies caught the most fish, and the bigger flies drew more strikes than smaller ones. We hooked close to a dozen fish our second day on the water and my attitude about winter fishing in the high desert was decidedly positive. Mickey Baron fighting cutthroat trout on a fly rod, early on Tuesday. Mickey with another one on later in the day. As soon as the sun started to drop behind the western hills, the bottom dropped out of the air temperature. What surprised me was the water temp of 47 degrees when the day time highs are commonly in the high 30s and night time temps drop to the low 20s. Water temps in the mid 40s and above are good winter conditions at Pyramid. Wednesday morning we awoke to a couple of inches of fresh powder. There were dark clouds spitting snow but no wind. We were putting down the first tire tracks on the way to the ramp. I had a feeling that this was going to be a good day. Our best results had come crossing over the points extending out into the lake or trolling their sides. We did catch fish trolling at random up to a half mile off shore but the points were the focus of the feeding fish. The difference between the sunny day on Tuesday and the dark sky on Wednesday was the fly color and depth. Tuesday the fish were down 20 feet eating olive and white flies, Wednesday they were at the top of the water column and black/red was the preferred color. Our last day also produced our two largest trout. 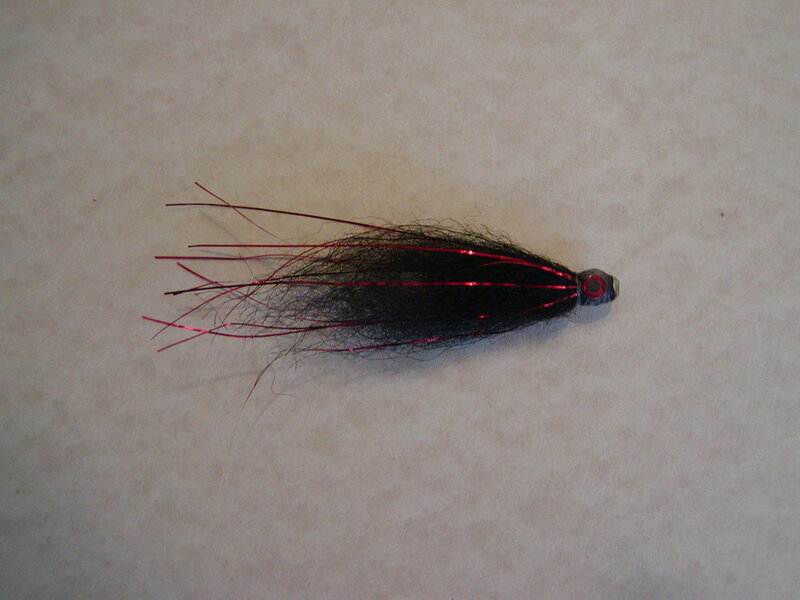 Trout with Black/Red Flash Tube Fly below a large #2 Action Disc. The hoped for huge fish did not materialize this trip. All of our trout were 18 to 24 inches. For Pyramid these are modest fish. For just about all of the trout waters I fish, any of these would be a notable catch. Landing more than 20 of them on a three day trip is good by any measure. With two exceptions all of my previous Pyramid fishing trips I have fished from shore. Getting out on the water is a different experience. With a fish finder you can get a good picture of the topography of the bottom which holds clues as to where to spend your time. Just south of Warrior Point there is a trench 110 feet deep with 60' depths surrounding it. This spot has produced a number of quality fish. Ed has a well equipped boat for a winter's day on the water. Pyramid has a well deserved reputation for treating the unsuspecting boater harshly. Lives are lost annually on the lake particularly in winter. I did notice an angler on the water in a small aluminum boat. He had launched from shore at Warrior Point and stayed close to shore fishing the same area we were working. So it is possible to get out on the water safely with a modest water craft. The water temp at Pyramid has only dropped two degrees to 45 in the past 10 days (written 01-07-2016). Typically January temps drop into the high 30's. I hope that we are close to the lows for this year. If the temps stay in the 40's fishing will remain good. As the temps rise into the low 50's in late winter or early spring the fishing will improve. As of right now Pyramid Lake Nevada is the best choice for quality winter fishing. For accommodations, hot food and supplies Crosby's Lodge is the place.